You might think the British press holds a monopoly on media controversy this month, with the shuttering of a 168-year-old tabloid over a phone-hacking scandal. Still, at least one Yank media concern has won recent unwelcome notoriety--fittingly enough, for airing misleading video footage on the national holiday commemorating American independence from the British crown. 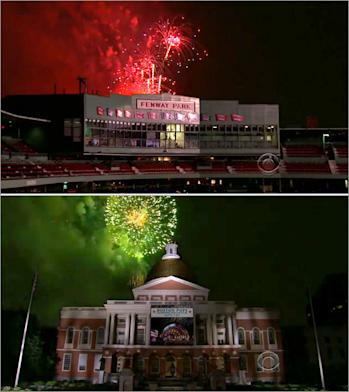 CBS has been caught doctoring Fourth of July footage after Bostonians realized Thursday that the network's images of fireworks over various city landmarks were not only breathtaking, but also fake. An area research scientist appears to have been among the first to point out the discrepancy on a Boston-based blog. Then the Boston Globe got wind of the scandal and blew the story up in its pages Friday, noting that "it would not have been geographically possible to see the fireworks above and behind the landmarks in question"--including the State House, Quincy Market, and home plate at Fenway Park--"since the display was launched from a barge in the Charles River and in directions away from those places." Mugar said the added images were above board because the show was entertainment and not news. He said it was no different than TV drama producer David E. Kelley using scenes from his native Boston in his show "Boston Legal'' but shooting the bulk of each episode on a studio set in Hollywood. "Absolutely, we're proud to show scenes from our city," Mugar said. "It's often only shown in film or in sporting matches. We were able to highlight great places in Boston, historical places with direct ties to the Fourth. So we think it was a good thing." CBS wouldn't offer up a statement for the story, but the Globe solicited the views of a media critic to put the whole thing in context. "It is an ethical issue, and to say it's not because the show was aired through CBS Entertainment is to imply that the entertainment side of CBS has no ethics,'' Eric Deggans, a CNN "Reliable Sources" regular, told the paper. "I think--especially in today's media environment--the most important commandment for media is to not mislead the viewer." You can read more here and watch part of the fireworks display here.